Well this sure happened sooner than expected: just a couple of weeks after they flipped on the lights for the first time, China's refitted Soviet hulk has made its ocean debut. This is their first claim to serious naval power. 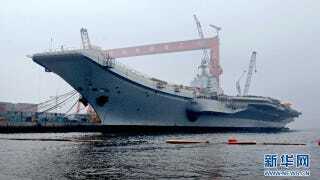 China&apos;s First Ever Aircraft Carrier: It&apos;s Aliiiiiiive! Although the movement of the enormous Shi Lang is likely to captivate (and unsettle) China's neighbors (and perhaps the Pentagon), some analysts think the mechanical sea trials are little more than that: a symbolic baby step. But let's not underestimate the power of symbolism. Carriers are, after all, the gigantic floating penises of naval hegemony: "I find myself observing the sea trials of the ex-Varyag as little more than one more minor achievement in what will be a long road for Chinese seapower; a largely insignificant event that will be one of many firsts during the development of aircraft carrier capabilities by China. With that said...the sea trials for ex-Varyag is also an enormous symbolic benchmark that truly does reflect the ascension of China," notes analyst Raymond Pritchett.